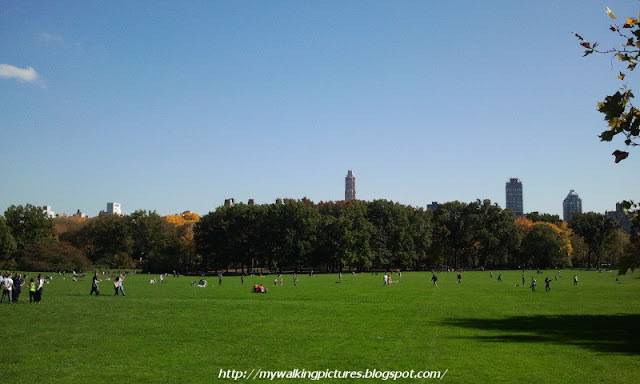 In a previous blog, I wrote about walking the length of Central Park from the southeast side and crossing the park to end it at the northwest side. Two weekends ago, I again walked the length of the Park going the opposite way. I started at the southwest entrance, the Merchant's Gate which was named to honor commerce and business professions for their important contribution to New York City, crossed the park at The Ramble and ended at Harlem Meer, at the northeast side of the Park. 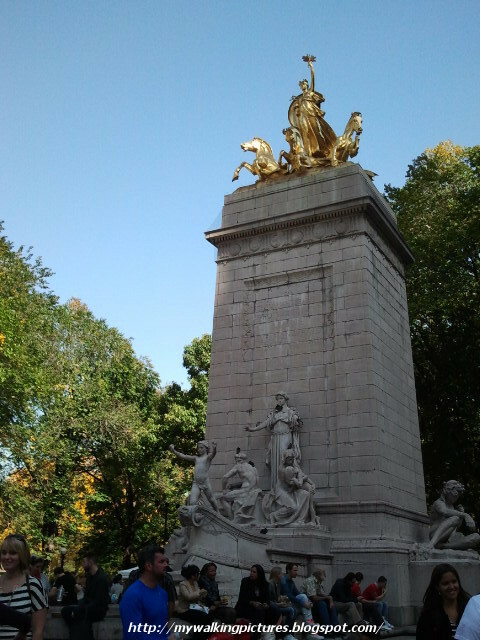 Standing near the Merchant's Gate is the Maine Monument. It commemorates the 260 American sailors who perished when the battleship Maine exploded in the harbor of Havana, Cuba, then under Spanish rule. 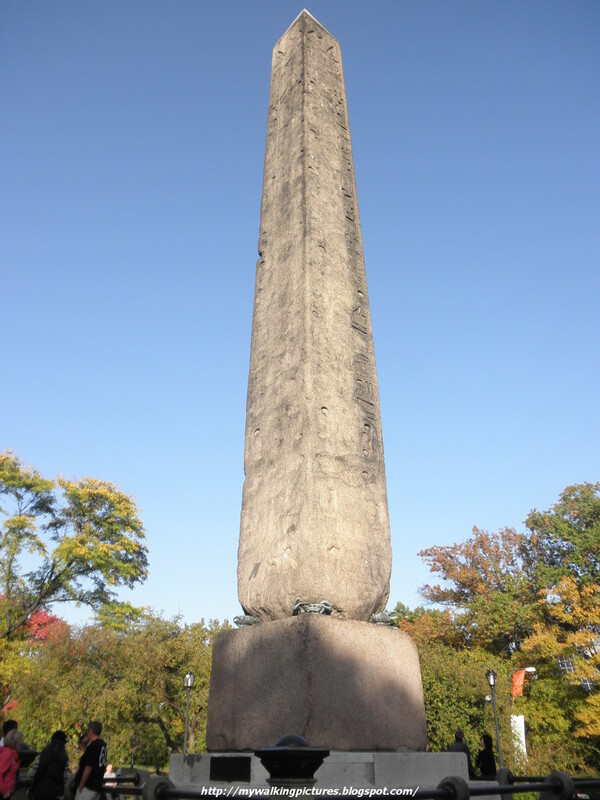 The monument consists of a pylon with a fountain at its base and sculptures surrounding it. At the top are gilded bronze figures representing Columbia Triumphant, her seashell chariot being drawn by three hippocampi. 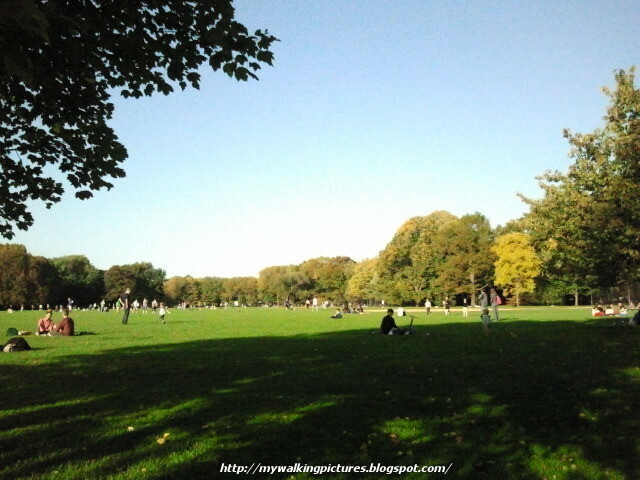 Inside the park I passed by some people just sitting on the grass and enjoying the beautiful and sunny day. A little further is one of the Park's five cast-iron bridges, the Pine Bank Bridge. 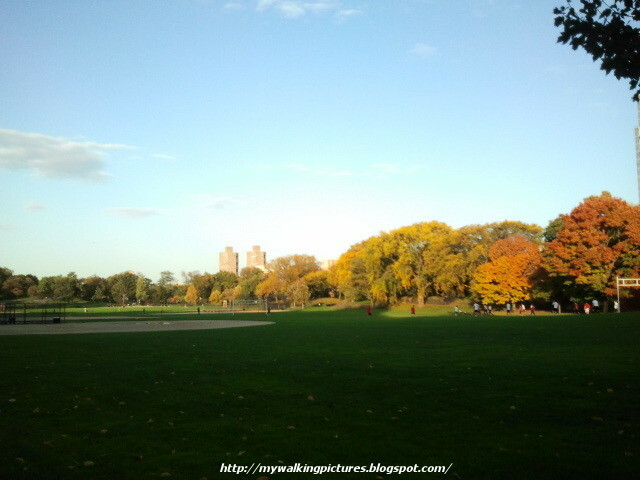 Walking further, I passed the Heckscher Ballfields where the leaves of the trees surrounding the area were starting to change color. Nearing the Tavern on the Green, I realized that the historic structure was under renovation when I saw this sign. 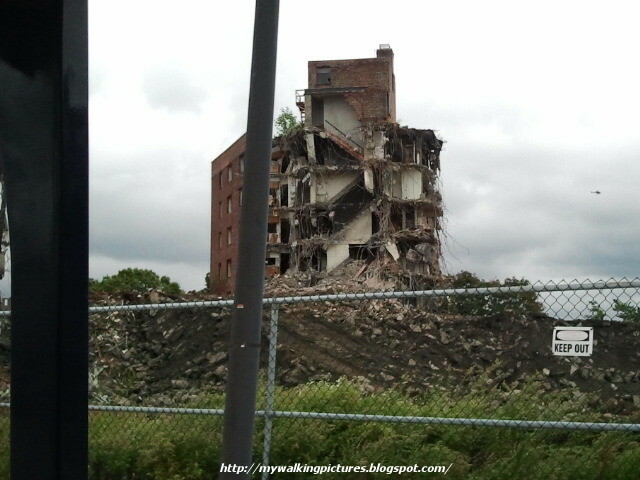 I hope the renovation will preserve the original structure. 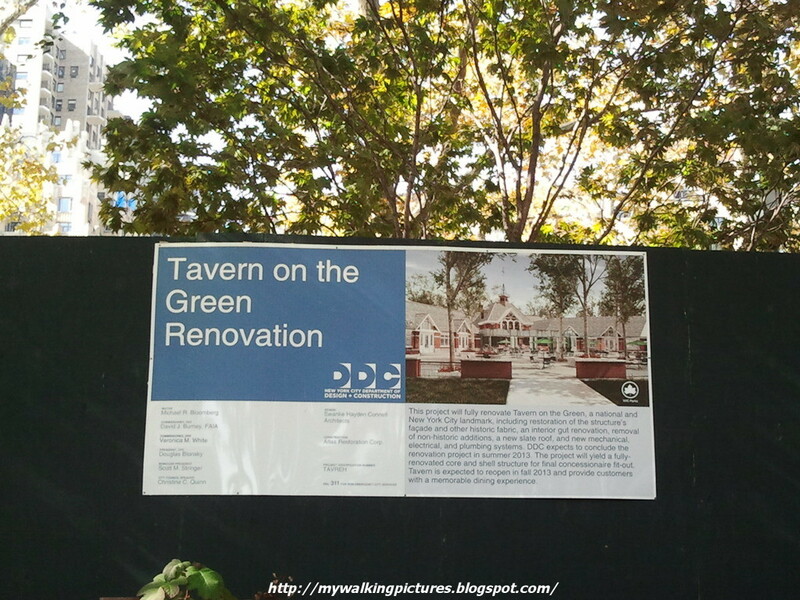 Across Tavern on the Green is Sheep Meadow, home to the Park's flock of sheep until the 1930s. The sheep and shepherd were housed in a Victorian building which became the Tavern on the Green restaurant. 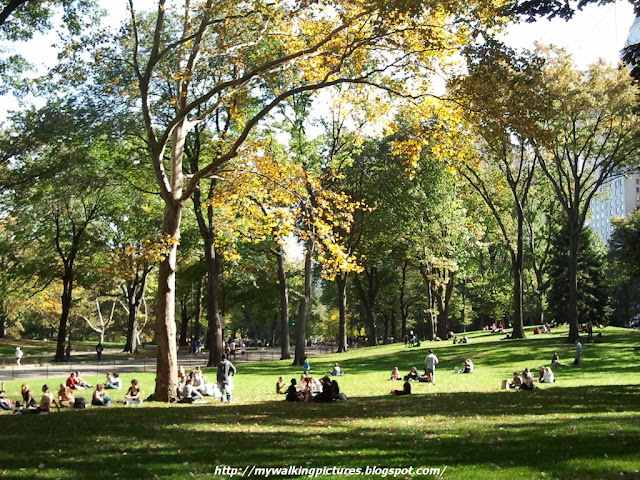 As usual, the meadow, which is the Park's first Quiet Zone, is always full of people relaxing and enjoying the day. 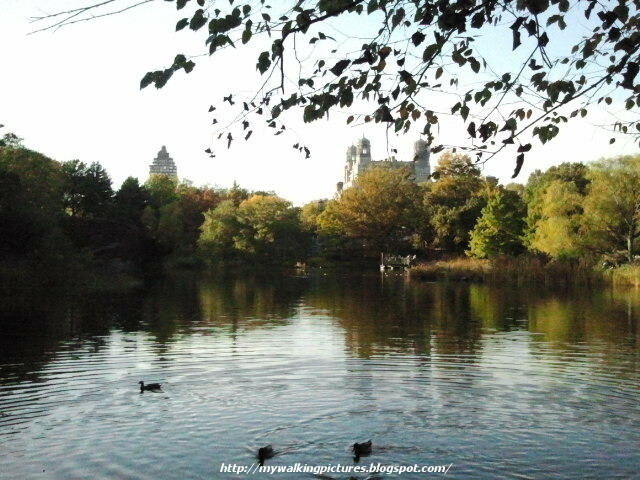 After Sheep Meadow, I turned east so I could drop by the Bethesda Fountain, the heart of Central Park. The Angel of the Waters is always an inspirational sight. I then walked back west to see the newly restored Cherry Hill Fountain. 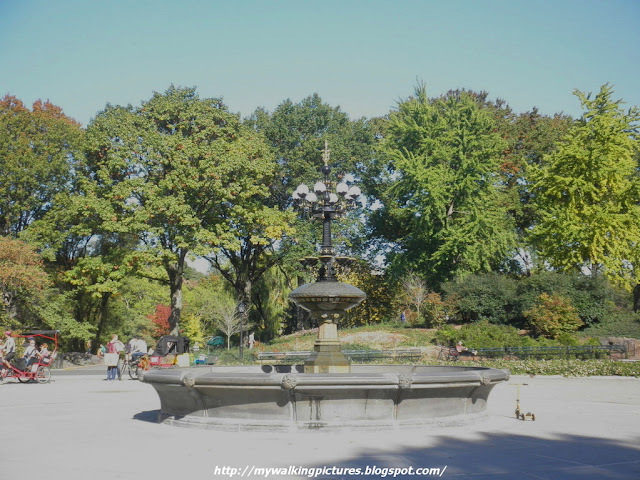 The fountain is at the center of the Cherry Hill Concourse, which was originally built as a scenic carriage turnaround with the fountain at its center and functioning as a watering trough for horses. From the concourse, I took a small path which led me to The Lake. A lot of people were boating and looking at the jewel of The Lake, the Bow Bridge. Named for its graceful shape, the bridge is easily recognizable for its role in many movies, television shows, and commercials. 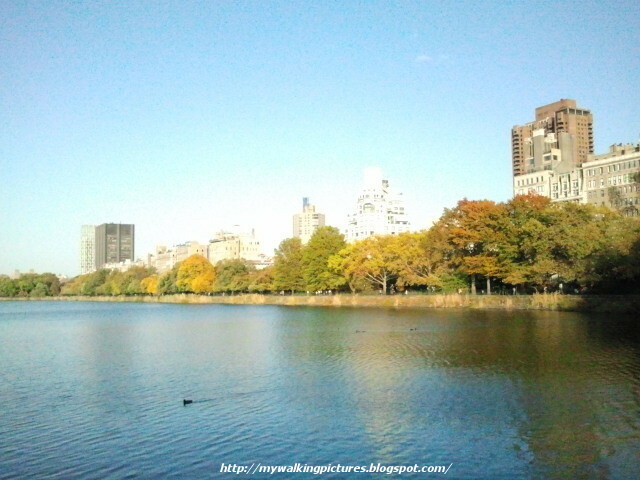 Across The Lake, the leaves on the trees in The Ramble are already changing colors. 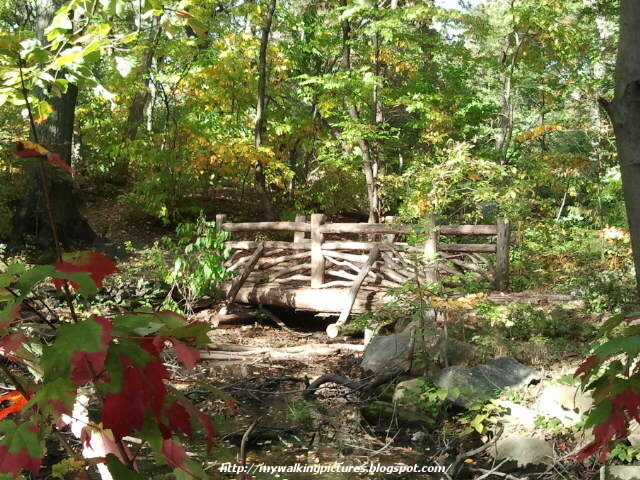 I then crossed the Oak Bridge to walk inside The Ramble. The Ramble is a lush woodland composed of 38 acres of winding paths, rustic bridges, streams and small open glades. From Wiki .. 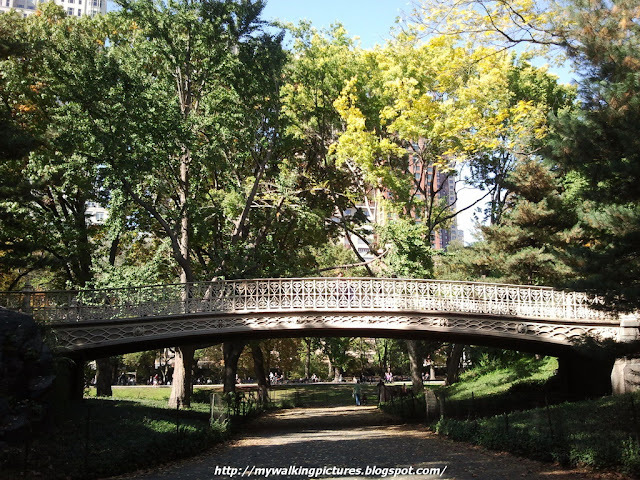 The Ramble was intended as a woodland walk through highly varied topography, a "wild garden" away from carriage drives and bridle paths, to be wandered in, or to be viewed as a "natural" landscape from the formal lakefront setting of Bethesda Terrace or from rented rowboats on the Lake. 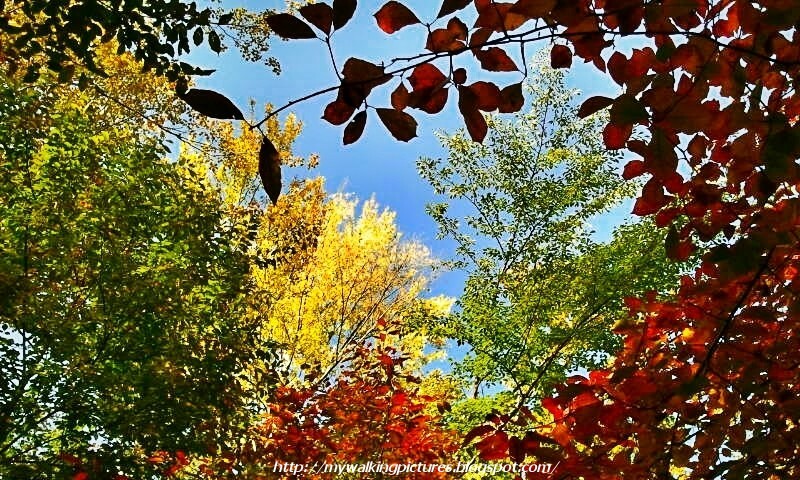 At the heart of the ramble, I looked up and saw the different colors of autumn. Such a pretty sight, it made me smile. I went out The Ramble at its east side, exiting near Cedar Hill. 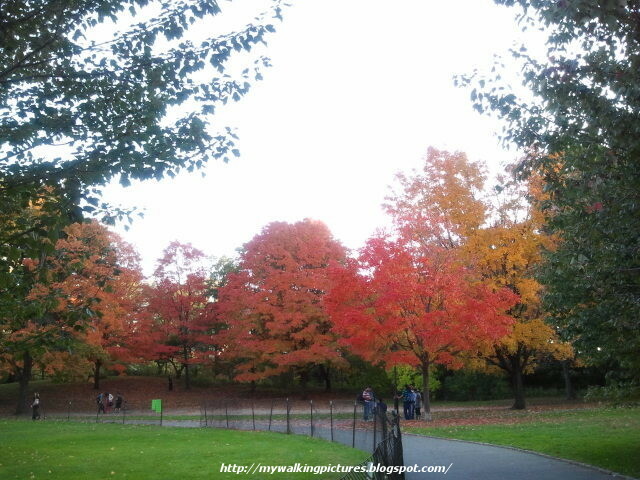 From there, I walked towards north at the back of the Metropolitan Museum of Art and saw this big Canadian maple tree, most of it already turned red. As I near the tree, I saw this lady painting it. 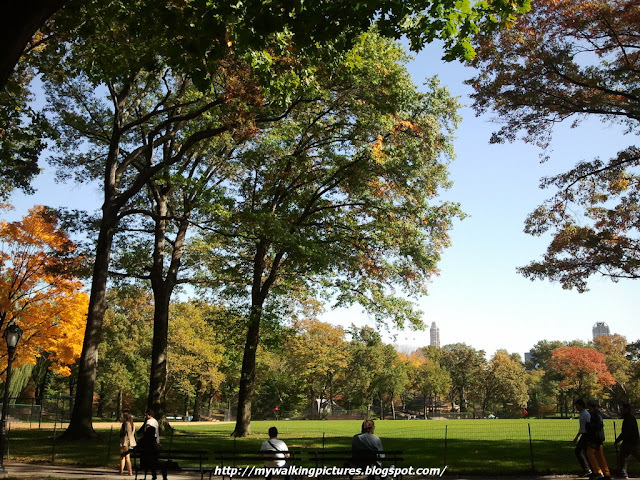 Then, instead of proceeding north, I walked back a little bit as that tree was near the Obelisk or Cleopatra's Needle, which is the oldest man-made object in Central Park. Did you know that transferring the 71-foot, 244-ton granite monument from Egypt to New York in 1880 took 112 days from the time the Obelisk touched upon the banks of the Hudson River until it reached the Park? 112 days, imagine that! 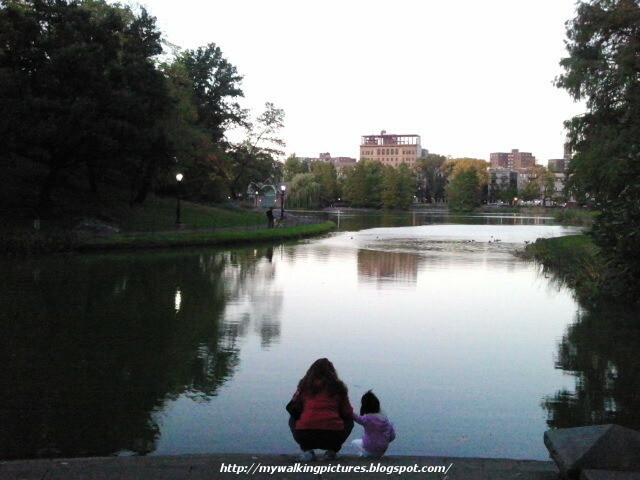 The obelisk is also near Turtle Pond, home to five kinds of turtles who live in the pond all year round. 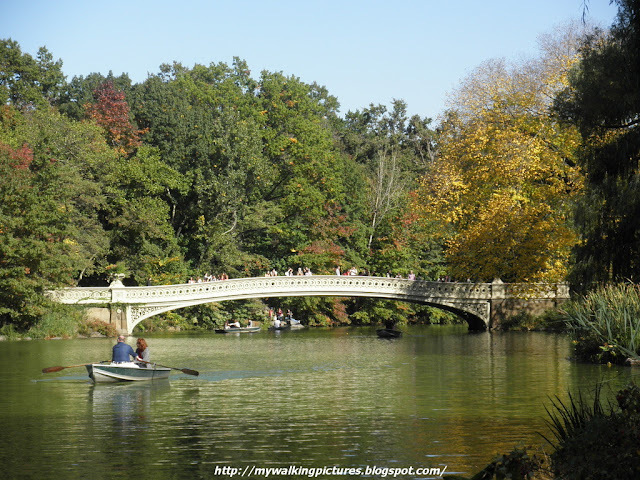 The pond is located near Belvedere Castle and the Delacorte Theater. 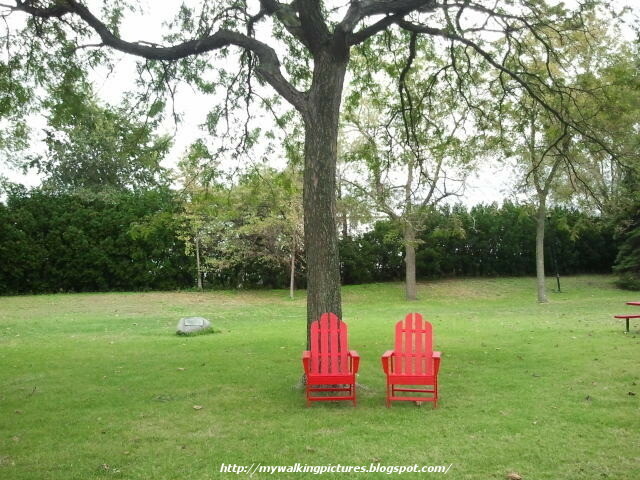 North of the pond is the Great Lawn, a sprawling 55 acres of green pastures. It is host to annual concerts such as the New York Philharmonic, as well as other memorable performances by world-class acts. I still love to watch the September 1981 reunion concert of Simon and Garfunkel held on this lawn and attended by more than half a million people. I can still hear the words ..
At the northern end of the Great Lawn is Arthur Ross Pinetum, a four-acre landscape that features 17 different species of pine trees. 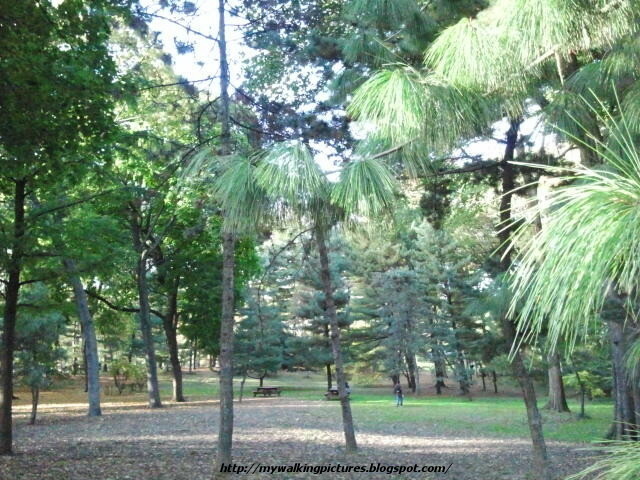 I think this is the only place in the park where the leaves of the trees stay green in autumn. I then crossed the 86th Street Transverse Road and arrived at the edge of the Jacqueline Kennedy Onassis Reservoir. A favorite of joggers, the reservoir is famous for its 1.58 mile track that encircles the 106-acre body of water. I got off the reservoir track and walked along the bridle path. 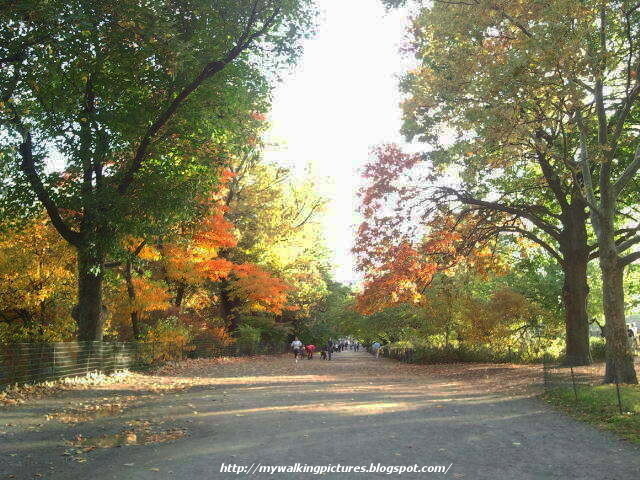 The leaves on the trees along the path were starting to change colors, too. An explosion of colors greeted me when I reached the southern end of the North Meadow. 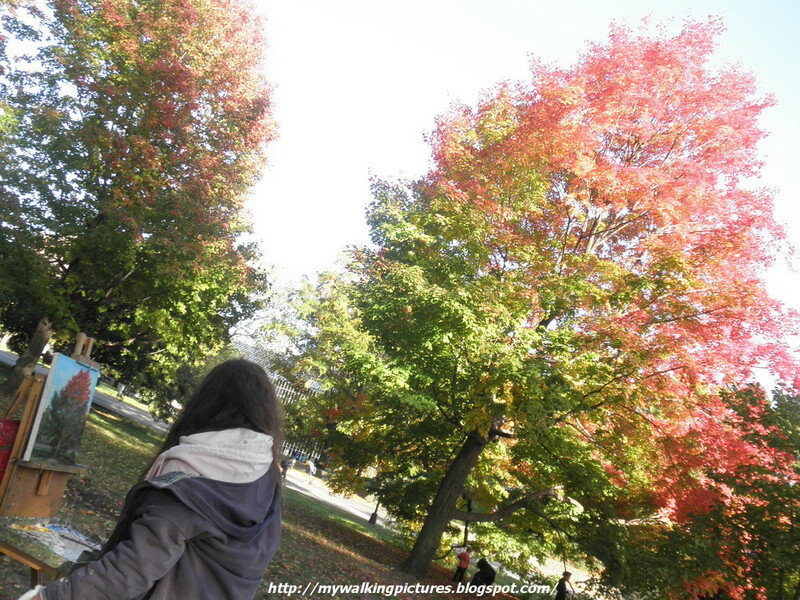 The trees were a burst of reds, oranges and yellows. The 23-acre North Meadow has 12 fields used for soccer, touch football, baseball and softball. It was already nearing sundown when I passed by and there were still some players on the field. 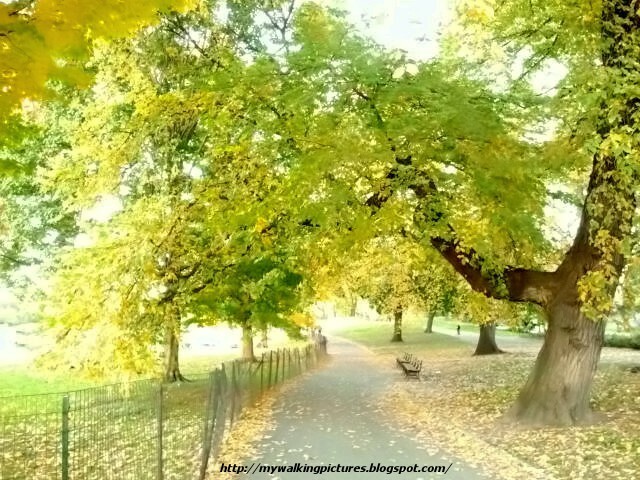 Yellow leaves carpet the East Drive as I walked along heading north towards the Conservatory Garden. Unfortunately, the Conservatory Garden closes at dusk and I was no longer able to go inside. 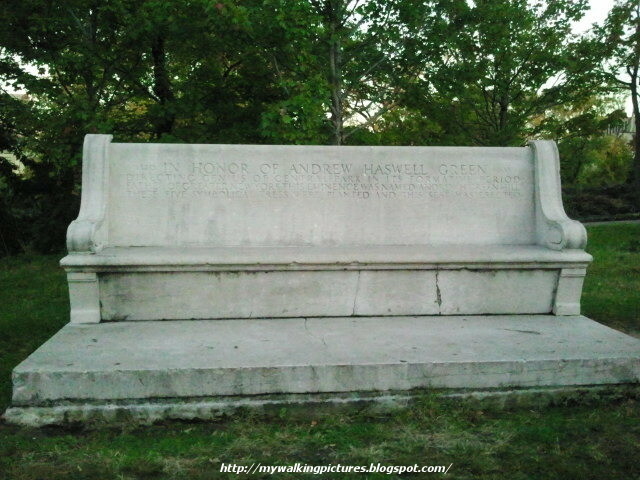 Passing by Fort Fish, I came across the bench dedicated to Andrew H. Green, the park comptroller during the 19th century. Although the name Andrew Haswell Green may not be as readily recognizable as Olmsted and Vaux, he actually played a significant role in the Parks system. First and foremost, he became known for his influential role in the unification of New York City, merging all five boroughs to make up Greater New York. For this achievement he was crowned the "Father of Consolidation," yet he was also responsible for making the Parks Commission an instrumental force in city planning. 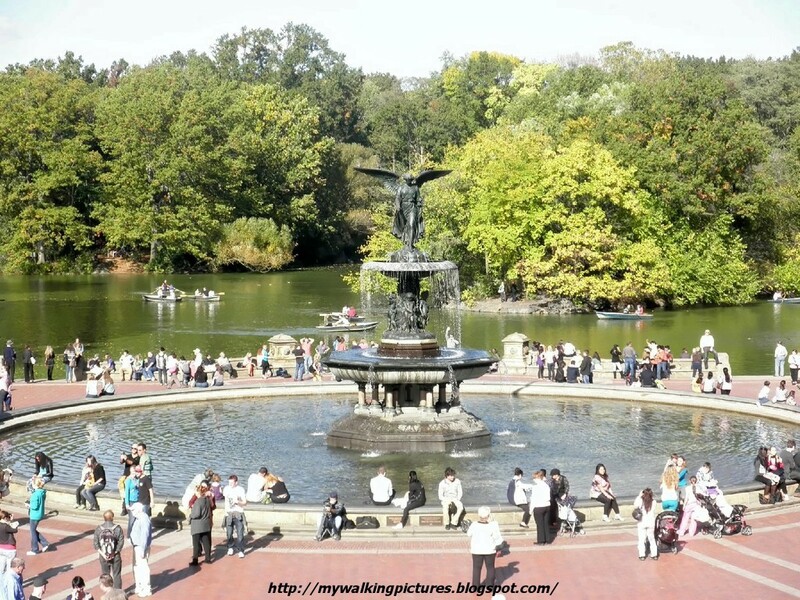 The level of his commitment to beautifying the City culminated with the beginning of Central Park. In 1857, the Central Park Commission was established and given control of the Park. Led by Green, this was the City’s first planning agency. They decided to establish a contest to determine who would design the Park. The winners of course were Frederick Law Olmsted and Calvert Vaux, who worked together to create The Greensward Plan. 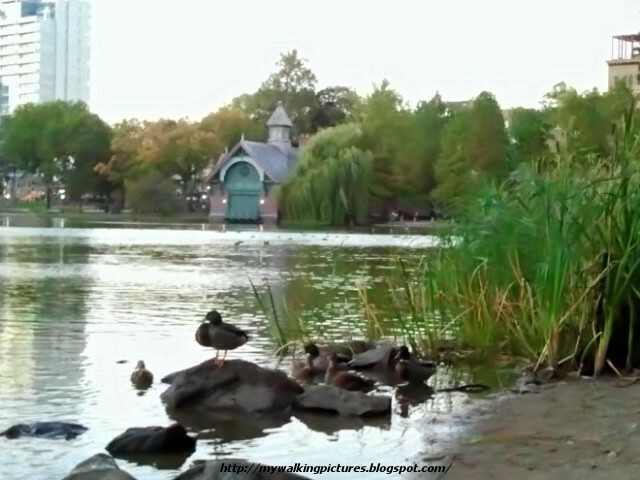 Finally, I reached Harlem Meer, at the northeast end of the Park. The meer was named after the Dutch word for "small sea". I was ready to lie down and rest after that long walk, Even the ducks at the Meer knew it was time to roost. 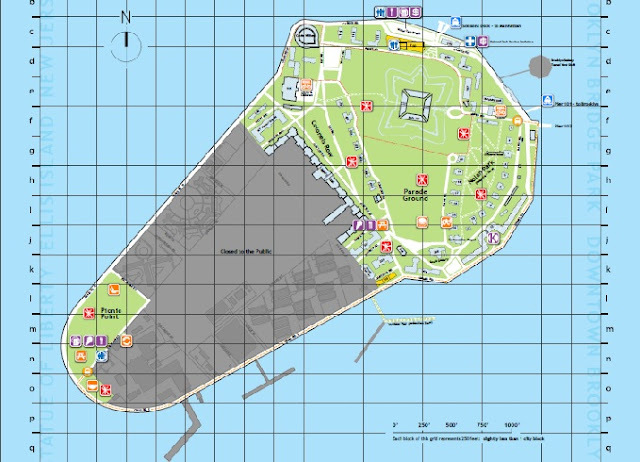 I marked my walk on the Park map, this was how it went ..
As I write this, the city is still struggling to restore things back to normal in the aftermath of Hurricane Sandy. I know a lot of trees in the park fell and I'm thankful for the Conservancy for all they do to take care of the Park make it a better place for all. I don't know if the colorful leaves will still be there for us to enjoy the autumn season. I count myself lucky I had seen the leaves turn before the hurricane blew them all away. 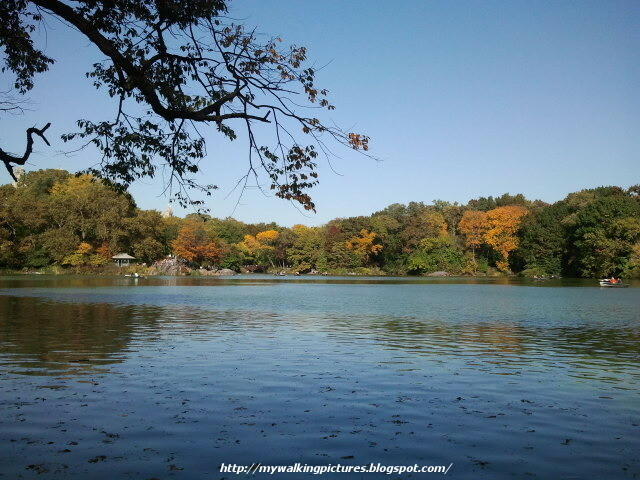 I hope most of the trees will still be intact with their colorful leaves. 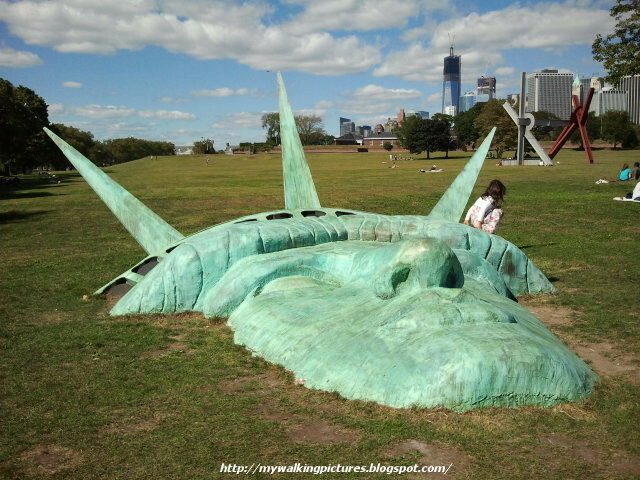 When I went to Governors Island last month, several large pieces of art around the grassy fields of the island caught my eye. 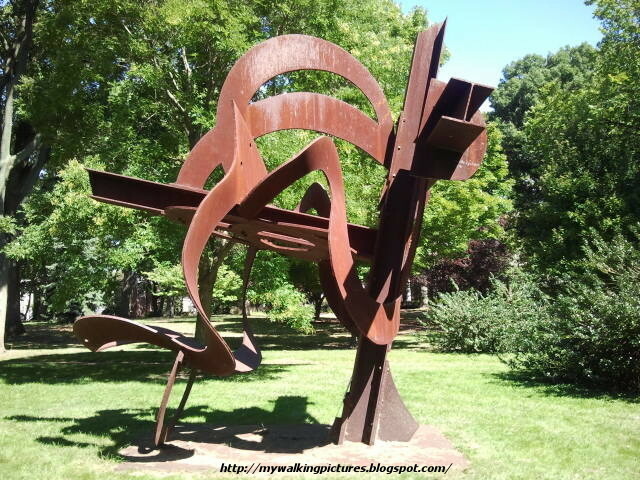 I searched about the island's art scene and learned these large sculptures were created by Mark di Suvero and the exhibit at the island was presented by Storm King Art Center. This is already the second season of the exhibit. From the Storm King website ..
Storm King Art Center announces a second season of the critically acclaimed exhibition Mark di Suvero at Governors Island: Presented by Storm King Art Center. The exhibition features two works not included last summer: a new sculpture, titled Dreamcatcher, which has never been on public view, and Chonk On (2002), which Mr. di Suvero has painted red especially for the exhibition. In addition, viewers will discover fresh perspectives on select works that Storm King and the artist are relocating on the 172-acre Island, a former military base that is now a vibrant public space. playfully named after Tamiami Trail, in southern Florida. All of the sculptures have an identifying tile indicating the title of the artwork, the year created, the materials used and where was it originally from. 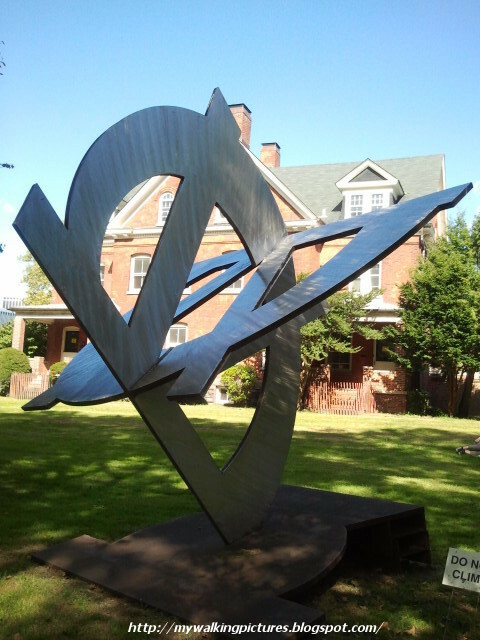 Around Nolan Park are three sculptures. 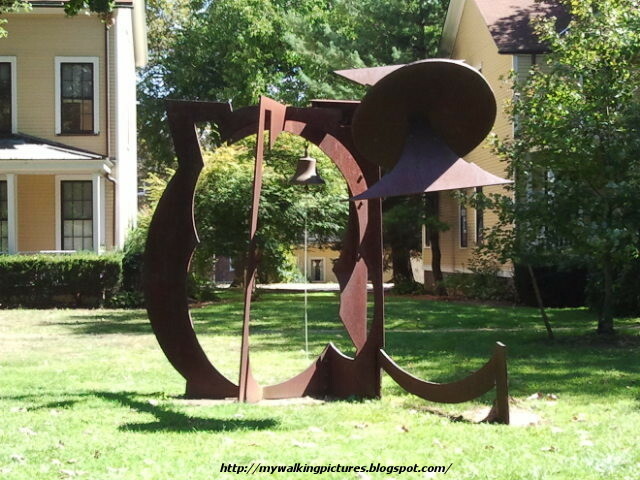 Near the area where we were during my niece's camp reunion was the sculpture "For Chris". 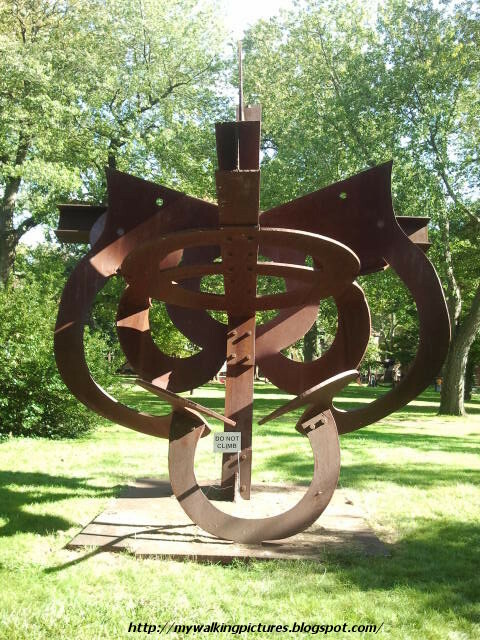 This sculpture is a memorial to di Suvero’s longtime friend Christopher Wilmarth (1943-1987), a sculptor who worked primarily with glass. 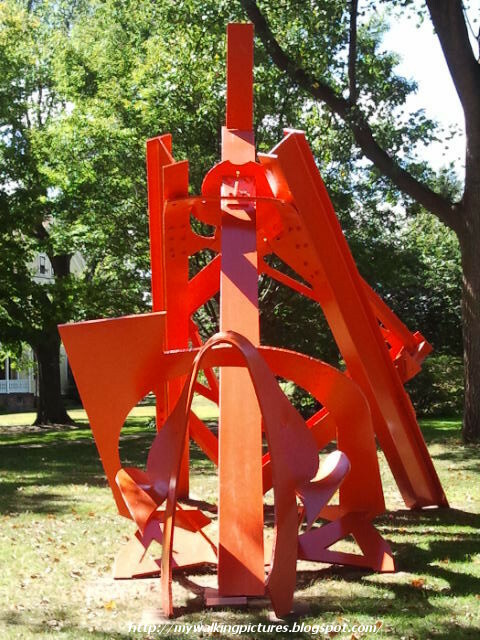 Like di Suvero, Wilmarth moved to New York from the San Francisco bay area and made work that responded intimately to New York’s industrial landscape. 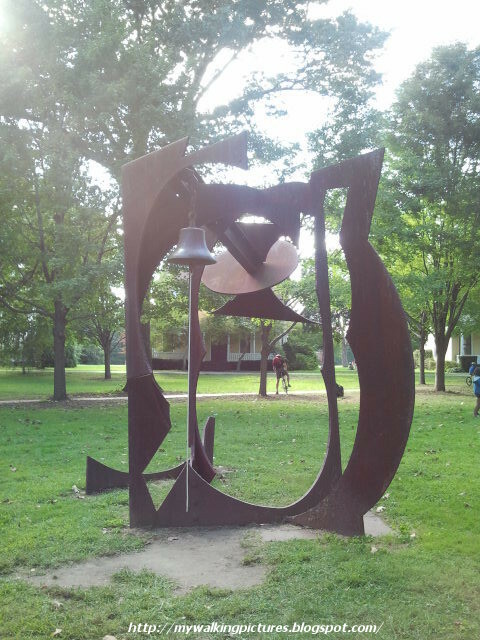 Di Suvero made For Chris after Wilmarth took his own life and incorporated into it a bell that visitors are invited to ring to pay tribute to Wilmarth. Here's a pic taken from another angle showing the bell. When we were there, kids would often go to the structure and tug on the rope to ring the bell. Near this sculpture is one of my favorite ones in the series. 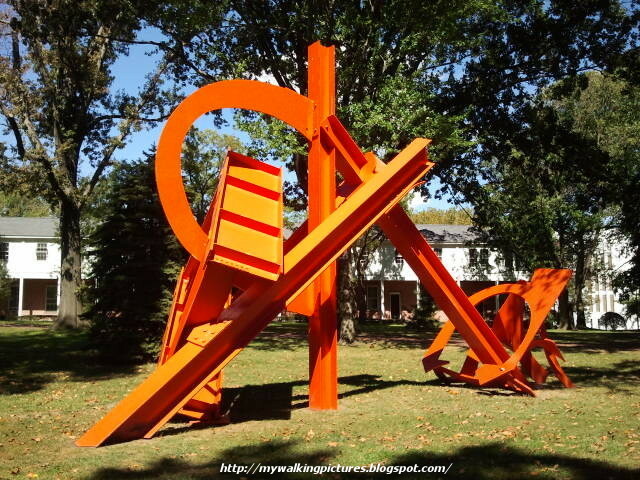 Named "Fruitloops", di Suvero created art that can connect on a personal level with all audiences. I love the symmetry of the pattern, although if you view it from another angle, it comes out as a different piece altogether. See what I mean? The other sculpture around Nolan Park is called Chonk On. 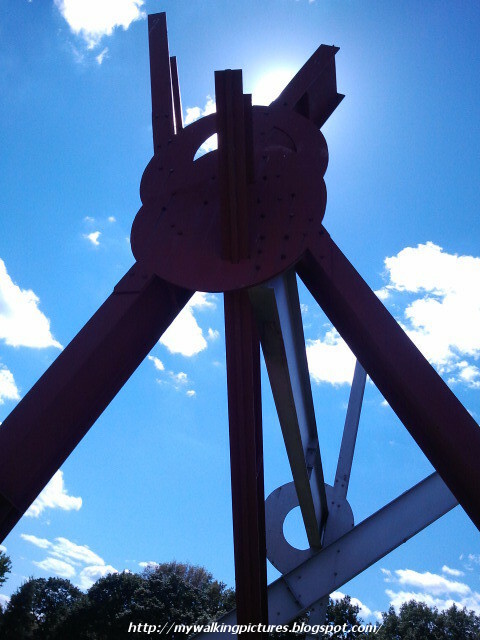 As mentioned in the Storm King website, Mr. di Suvero has painted it red especially for the exhibition. Hmm, looks like orange to me, though. In the vast grassy area of Parade Grounds are three more sculptures. The one nearest to the houses of Nolan Park is called Rust Angel. Seems to me there's an angel wearing sneakers resting on the platform. Here's a pic from another angle, taken when the afternoon sun was high up the sky, the color seems different. Around the center of Parade Ground is this huge sculpture named Old Buddy. The titles of di Suvero’s works are often whimsical, rather than definitive. With them, di Suvero intends to give the viewer only one of many possible meanings for the work that they describe. As he has said, “I want the title, which is like the handle on a cup, to give the person another view as to what is inside the cup.” Di Suvero’s “old buddy” Rosko was a dog who protected him, making it possible for him to work in a studio located on a lonely industrial pier. Here's a close up of the top part. The next sculpture is near Colonel's Row and is named New Beginnings. Seems to me an apt name, looks like the artwork is poised for flight. Another sculpture is near the island's other chapel, the now-decommissioned St. Mary Star of the Sea Catholic Chapel, and is named Mahatma. 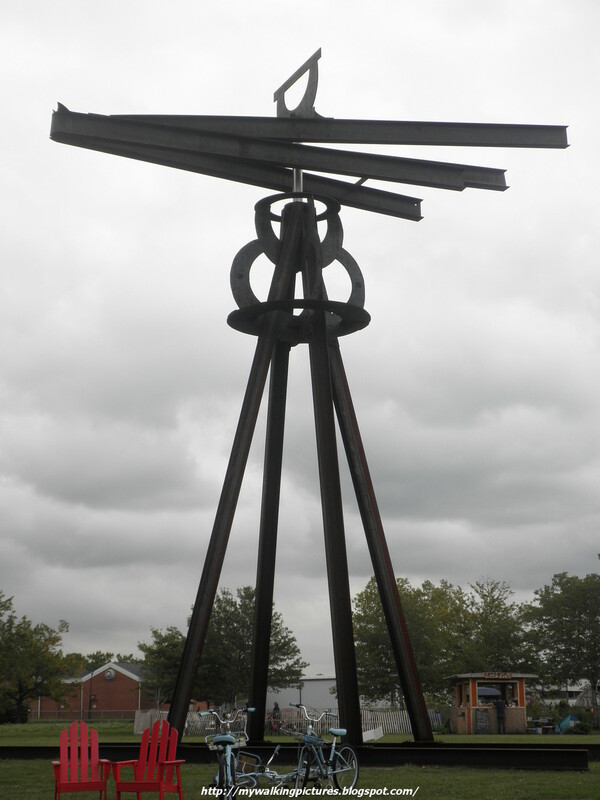 The title references Mahatma Ghandi, a figure of great influence for di Suvero. Mahatma has a 7,000-pound beam, bent into a “U” shape that rocks and turns on top of a sentinel-like I-beam, producing continually changing shadows and perspectives. 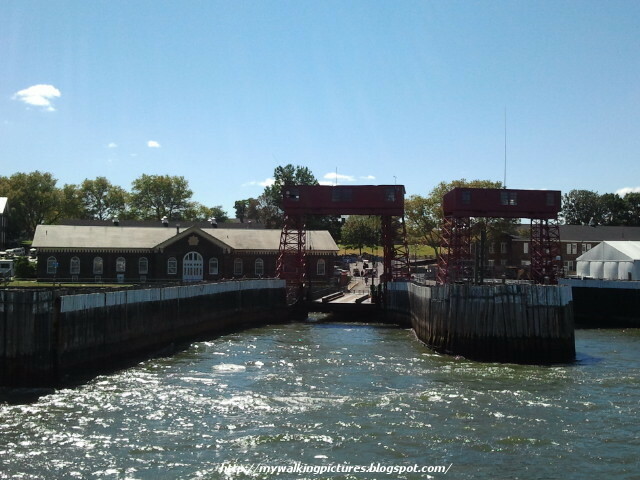 The above pics were the ones I took the first time I was in Governors Island last September 15. 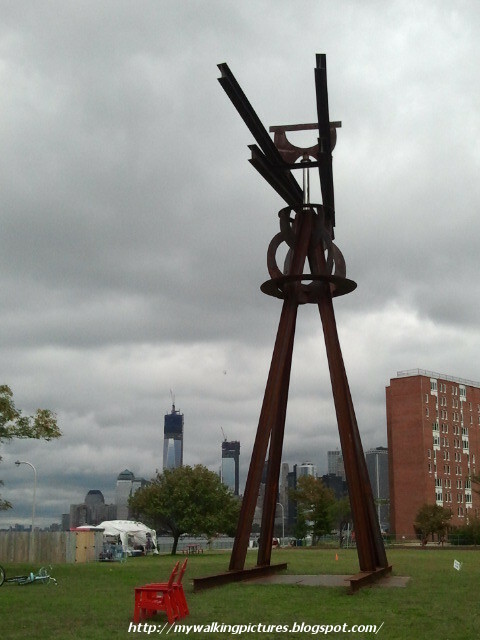 Two weeks later, on the last Saturday of September, the last weekend the island was open to visitors for the 2012 season, I returned to the island on a cloudy and dark day to take pics of the rest of di Suvero's work displayed in Picnic Point, the northernmost part of the island. On the map below, location of di Suvero's works are marked with a white star in a red square. 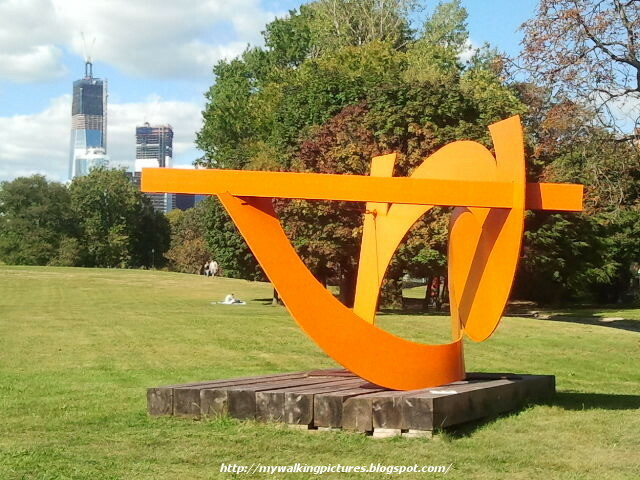 I took the tram to Picnic Point where four large sculptures are located. The first one I came across was called She. Peace, freedom and the civic responsibility of the artist have long been concerns for di Suvero, who was imprisoned while protesting the Vietnam War. 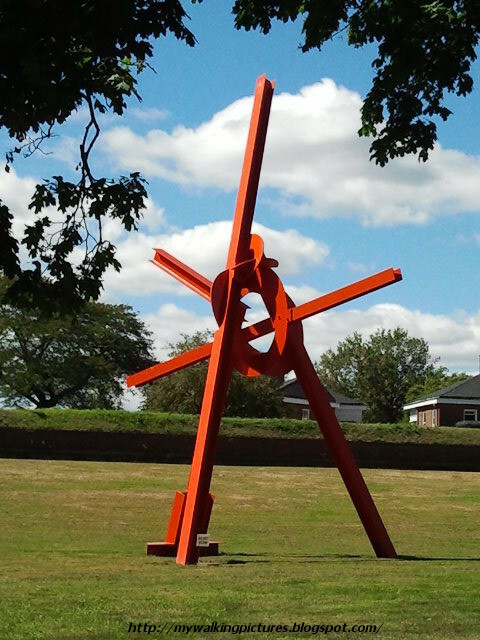 In sculptures like She, the design of which incorporates a hanging swing, di Suvero has worked to transform a viewer’s relationship with art, inviting participation and fostering a sense of inclusiveness. She also proposes new and intimate uses for the world’s discarded industrial products: a crane hook and the rusty steel barrel of a steamroller are incorporated into its design. Here's a close-up of the steel barrel. Near She is another imposing piece named Figulo. 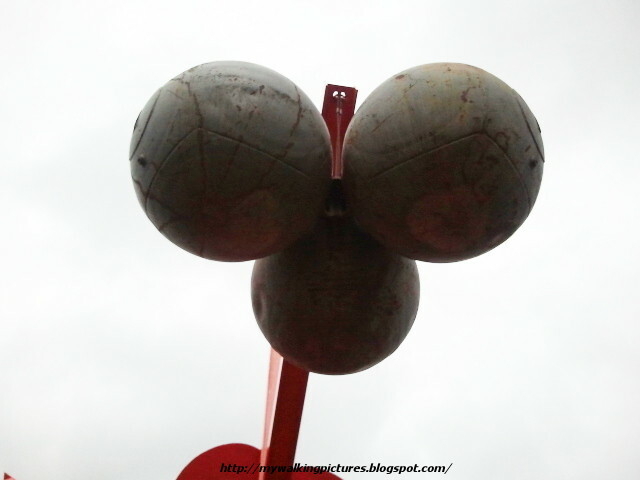 Completed only this year, the sculpture incorporates round sea buoys that the artist collected many years ago. Figolu is the name of a French fig cookie. 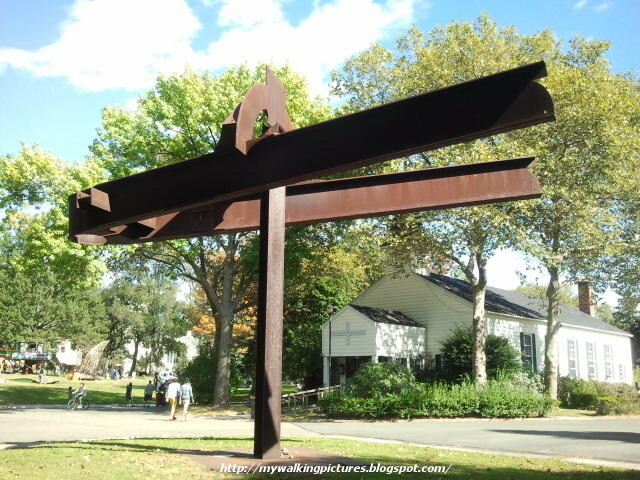 Then there's Will, a forty-two-foot-high I-beam sculpture dating from 1994. 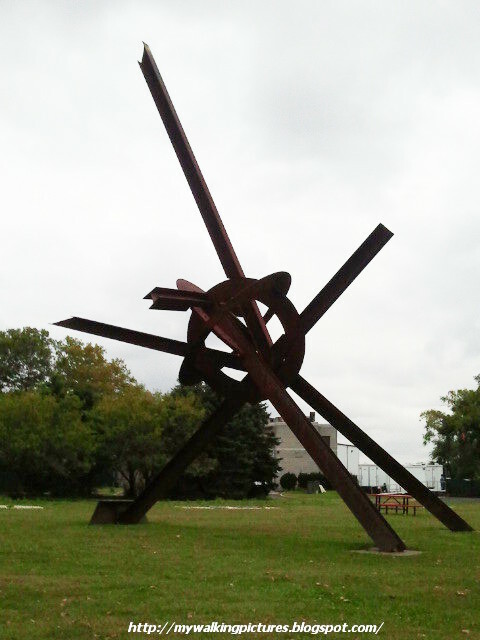 Near this sculpture is di Suvero's newest one which has never been on public view and is titled Dreamcatcher. It is a roughly fifty-foot high steel composition with a bentsteel, mobile element near its top. Here's a pic taken from another angle. Hmm .. looks like a giant steel robot with arms outstretched. What do you think? Going over the Storm King website, i realized I missed taking a picture of one piece titled Po-um. I believe I saw this around the Fort Jay area but never got near due to time constraints during my visits to the island. I'll share instead the picture from the Storm King website. 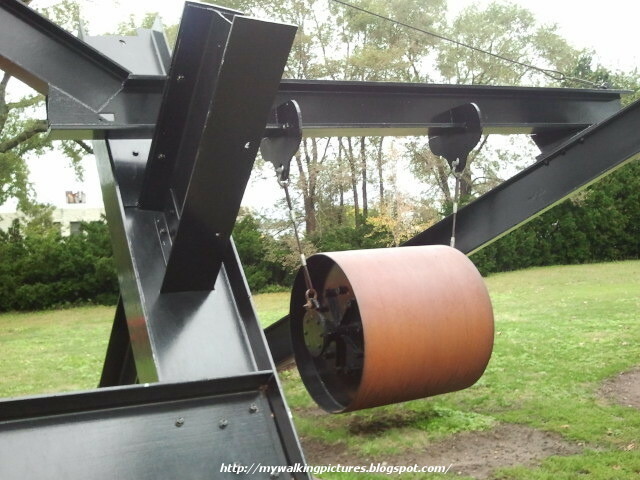 The website has a great video filmed by Dirk Van Dall featuring Mark di Suvero interviewed by Tom Eccles where di Suvero gave short descriptions of each of the art pieces. He also talked about his lifelong fascination with steel, his early employment at the Fulton Fish Market, how kids inspired him to begin creating large-scale fun works, and how he makes the seemingly immobile move. 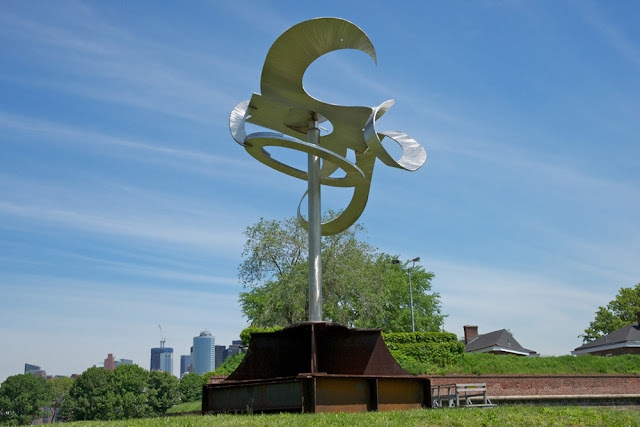 The short film also captured how the art pieces were transported down the Hudson from the Storm King campus an hour north of the city and followed di Suvero around the island as the pieces were installed. 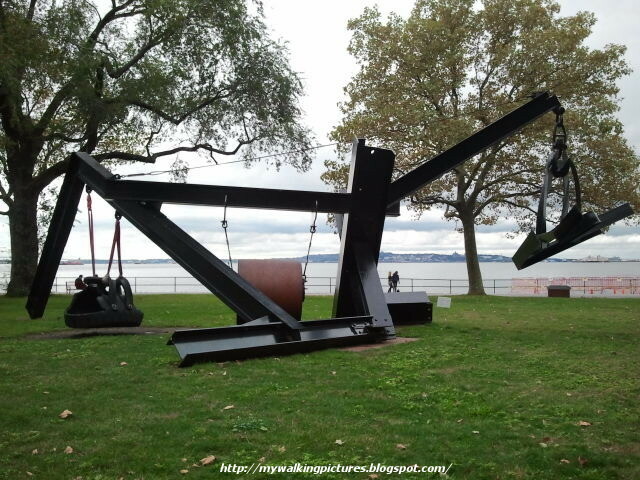 I hope there will be a third season for Mark di Suvero at Governors Island. That would be one thing to look forward to when the island opens in the next season. 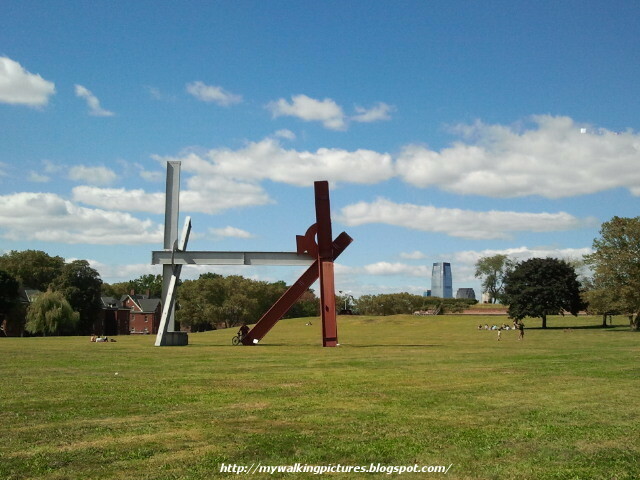 For the rest of my pics, here's my album on Flickr - Mark di Suvero at Governors Island. When my sister told me my niece's summer camp group is having a reunion in Governors Island, I volunteered to go with them. I have long wanted to go there but just didn't find the time, so last September 15, I went to the island for the first time. 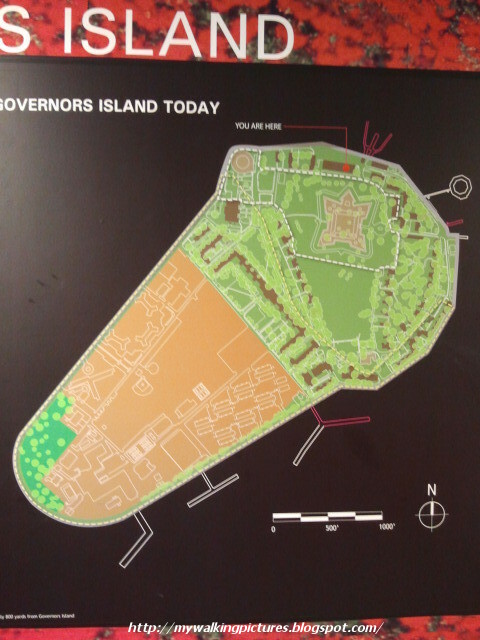 Governors Island is recognized as the birthplace of the state of New York. Much of the island is considered as national monument and about 92 acres of the northern half is open to the public for several months in the summer and early fall. The circumferential road around the island is also open to the public. The green portion in the map are the parts accessible to the public. This year, the island was open for only 40 days, every Saturdays, Sundays and holidays from Memorial Day up to the last Sunday of September. The island is accessed by free ferries from Brooklyn and Manhattan. 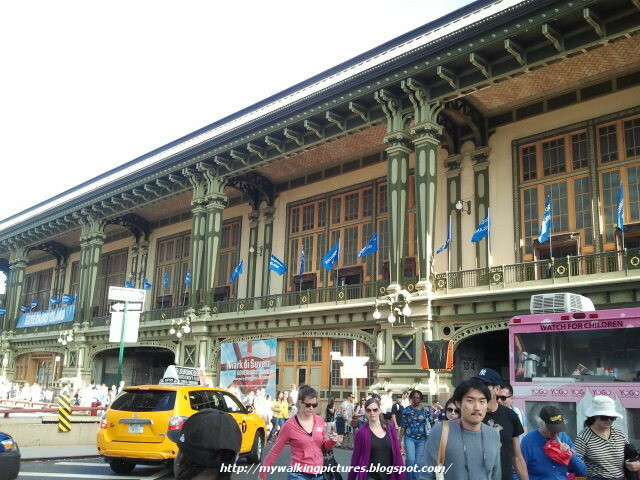 On the Manhattan side, you can take the ferry from the historic Battery Maritime Building. We were too much in a hurry to catch the ferry I didn't have enough time to take many pics but here's one of the front of the building. The picture does not do justice to its beauty, I may need to come back and take pictures of its features one of these days. 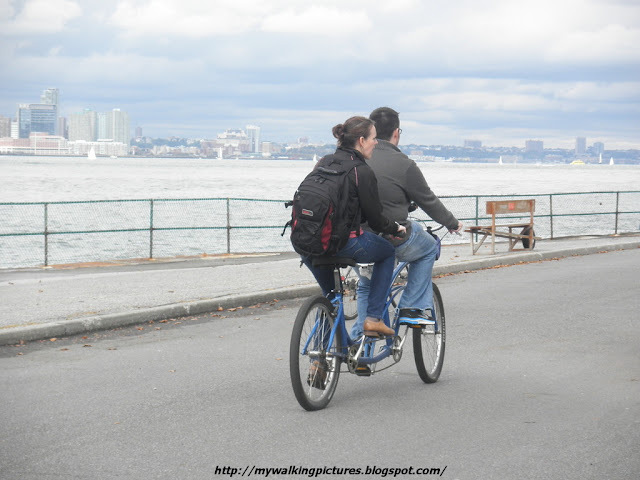 Governors Island is right across lower Manhattan. While waiting for the ferry to fill up, I soak up the views across the water. 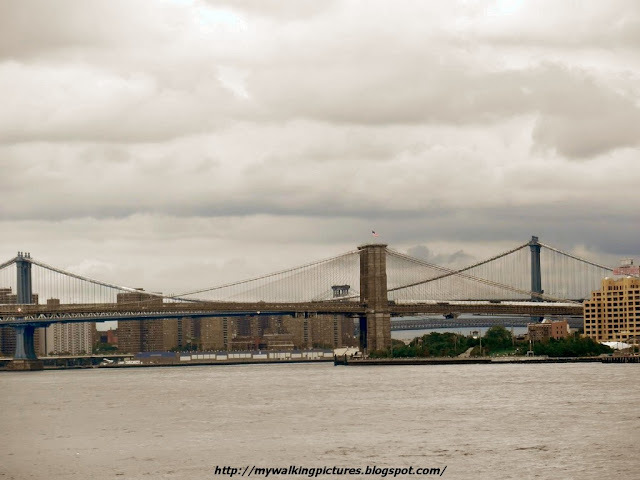 Gazing towards the island, you can see Lady Liberty at your right while at your left are the three bridges spanning the East River and connecting Manhattan with Brooklyn. Fondly referred to as the BMW, they're the Brooklyn Bridge, Manhattan Bridge and Williamsburg Bridge. After a very short ride, we arrived at the island. As you can see from the map above, going right will lead you to Castle Williams while the left way leads to Nolan Park, where my niece's friends were waiting. 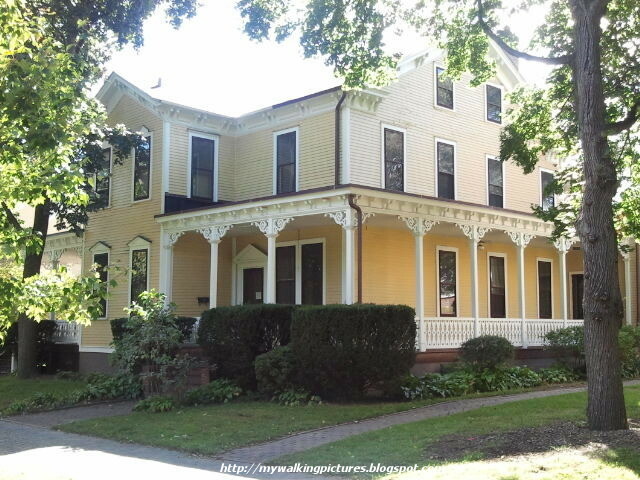 Nolan Park is a great picnic area, surrounded by houses and buildings that date back to 1810. All the houses are painted light yellow, almost all are empty except for those that are used to house art exhibitions during the open season. When we were there, there was even a wedding reception near where we were. Here's one of the houses. I tried to covered the area as much as I can during the limited time that I was there. At the edge of Nolan Park, I came across the Chapel of St. Cornelius the Centurion which is part of the Trinity Parish in lower Manhattan. 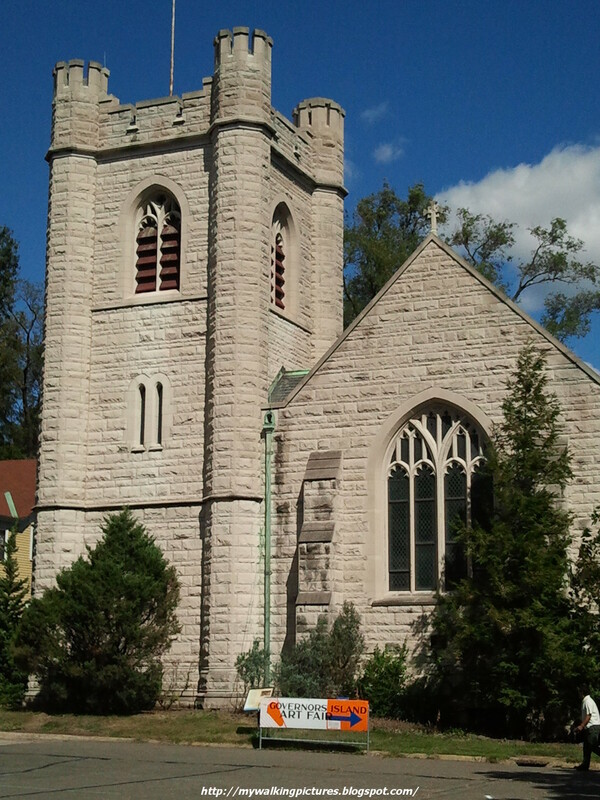 The first chapel in 1846 was made of wood but was later replaced with this Gothic style building. The chapel was named for the sainted Roman centurion, known as the first Gentile to convert to the Christian faith. The chapel was open when I passed by although it was empty inside. 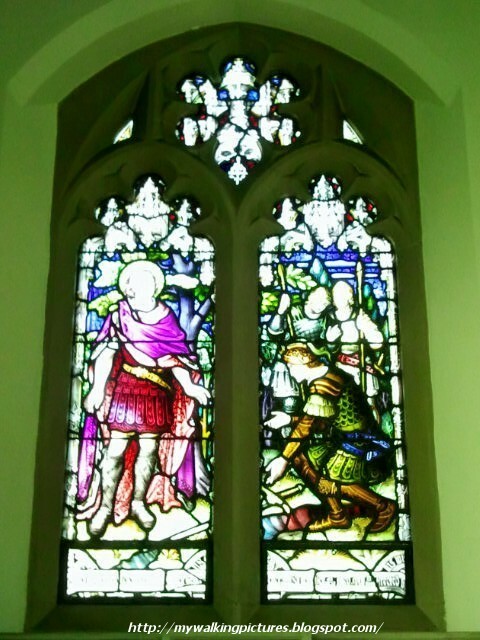 I'm not sure if it is still being used, but the stained glass windows are beautiful. 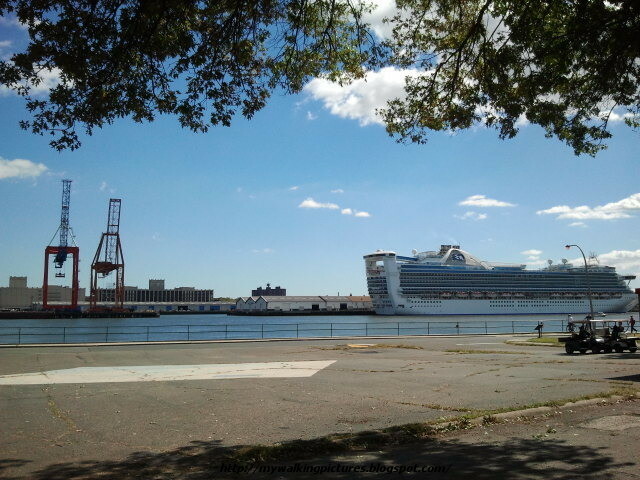 The chapel is near the Brooklyn side of the island and you can see the Brooklyn Cruise Terminal from outside the chapel. Also near the chapel is the South Battery, which was erected during the war of 1812 to guard Buttermilk Channel. 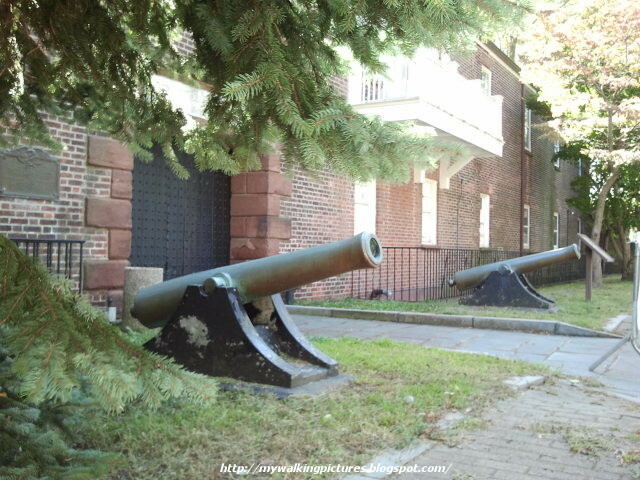 A pair of cannons guard the entrance. 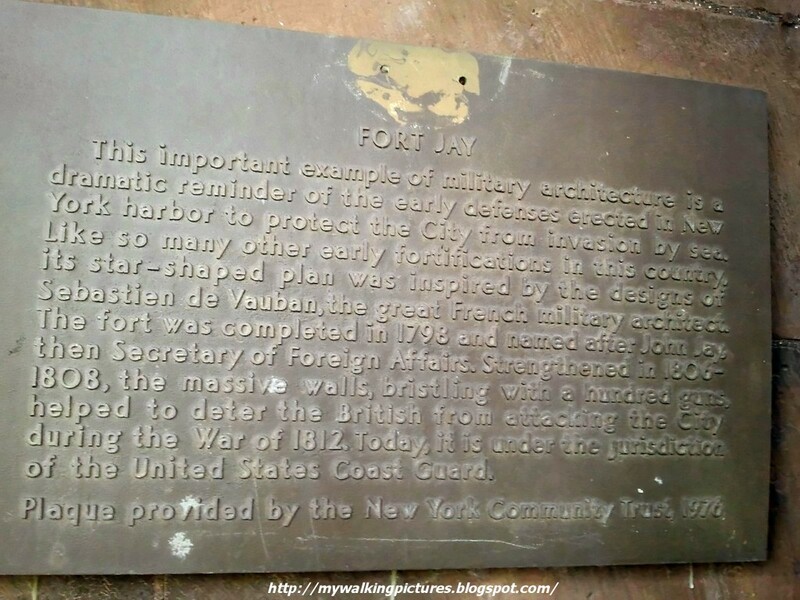 The star-shaped area you see in the map is Fort Jay, one of the island's former army post. On top of its entrance is a replica of the War Dept. seal. 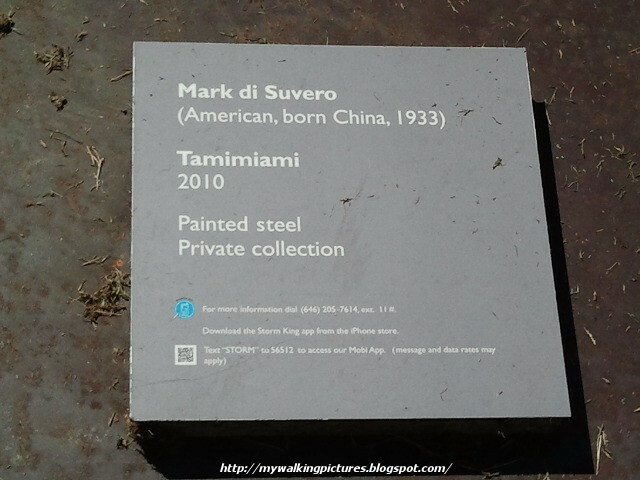 This link gives you a nice before and after pic of the sculpture, while this plaque gives a little info about the more than 200 year old structure. Between Fort Jay and Nolan Park is a vast expanse of green grass called the Parade Ground. It is often the site for public artwork and other activities. Mark di Suvero's large art pieces, presented by Storm King Art Center, are seen around the island. Here's one of his art pieces placed right in the middle of the grassy field. 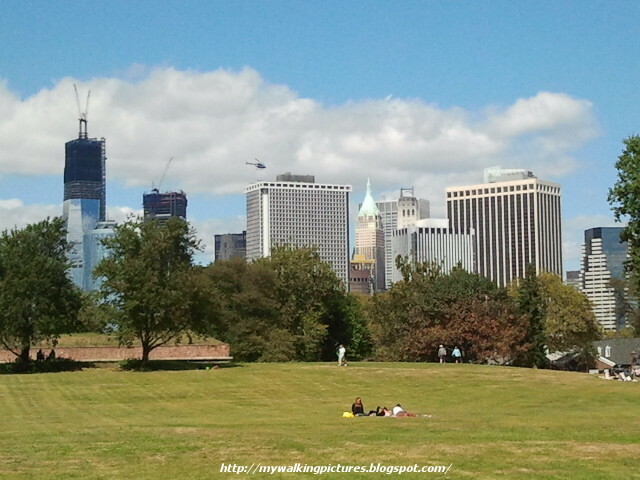 The Parade Ground also has nice views of lower Manhattan. 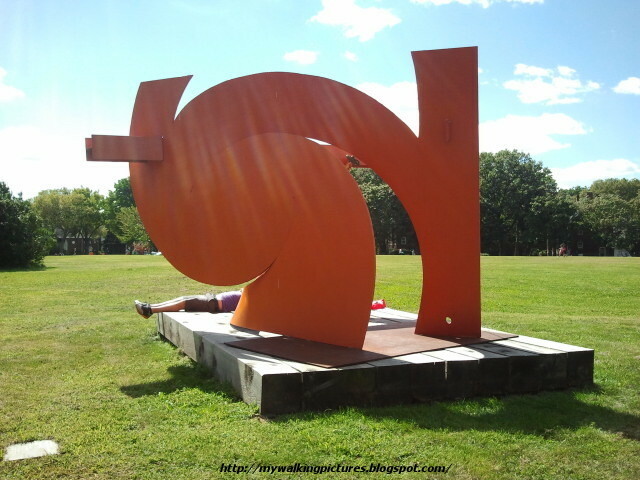 At the time of our visit, Governors Island just opened the Figment Interactive Sculpture Park and Mini Golf. 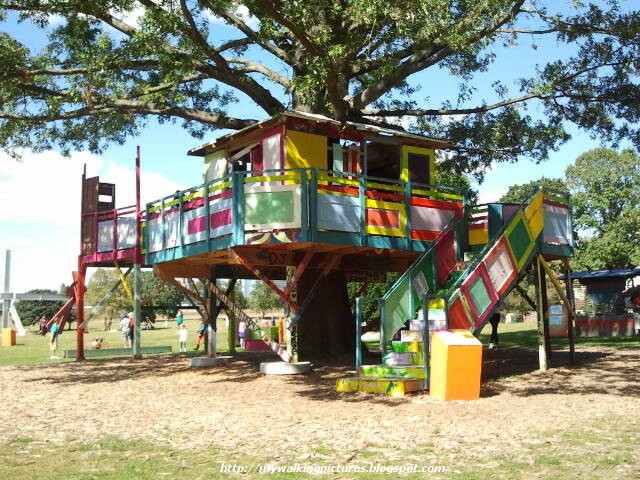 I love the tree house ..
and the Face of Liberty, which is a hit with the kids as it makes a good slide. Colonel's Row was filled with people when I walked by. Signs were everywhere advising everyone of the ongoing construction for the planned improvements. At the end of the area is the island's other national monument, Castle Williams. I didn't go inside as I was pressed for time but the area outside the fortification has awesome views of lower Manhattan. There's still a lot of the island I wanted to explore so I promised myself to come back before the 2012 season close. I did come back, on the last Saturday the island was open for the year. It was a very gray and cloudy day. It was also Museum Day Live! and I had to juggle my time between Governors Island and the New York Historical Society. 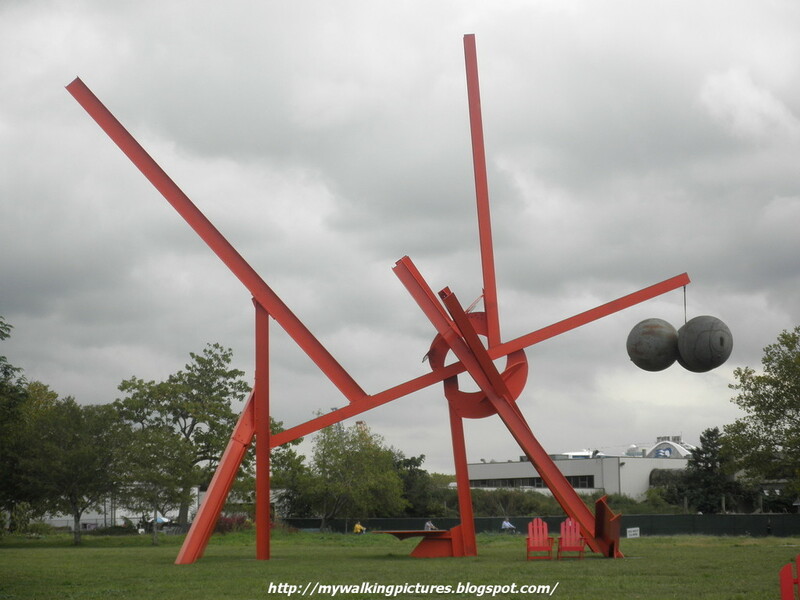 My second visit to the island was primarily to complete my pictures of Mark di Suvero's artwork around the island. 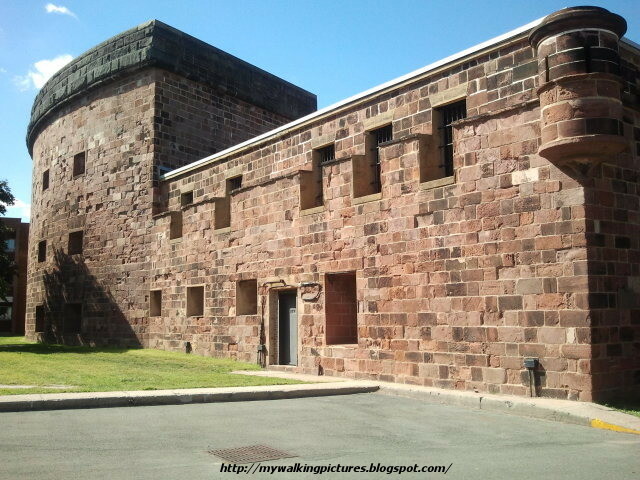 However, when I passed by Castle Williams, the park rangers were offering a free tour which I did not pass up and will write about in a future blog. The tour further shortened my stay at the island so instead of walking towards Picnic Point where some of Suvero's sculptures are located, I took the tram instead. On the way, the tram passed by a lot of old and unused buildings being destroyed to make way for the island's planned improvements. 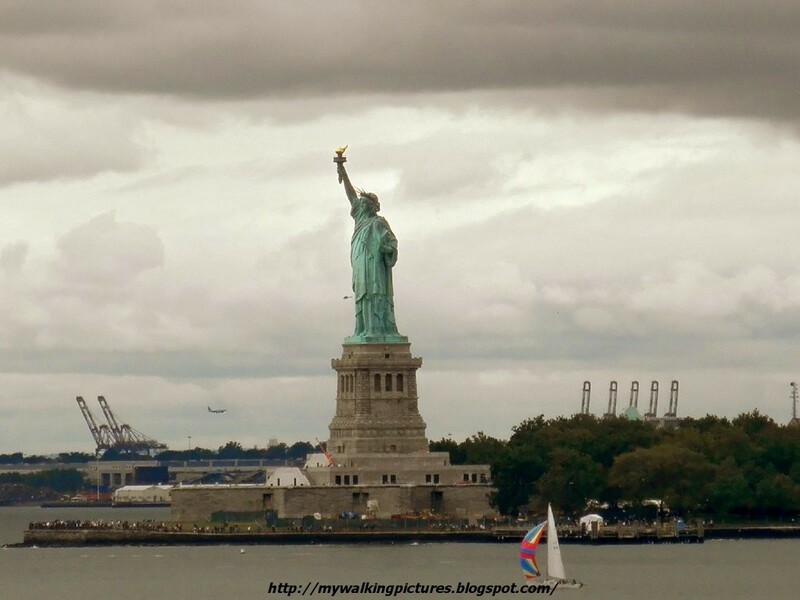 Picnic point has awesome views of Lady Liberty. 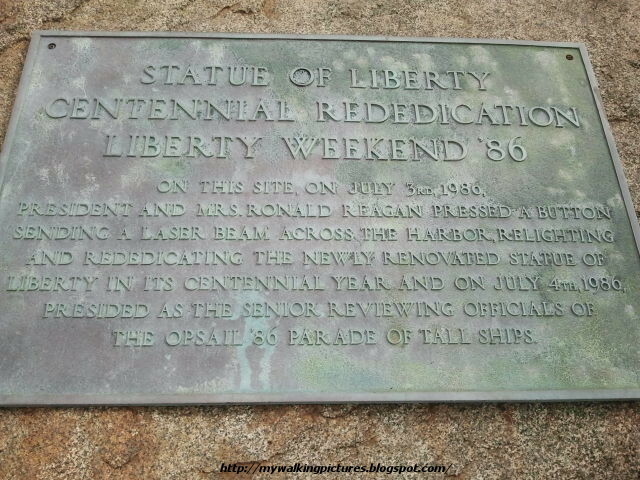 It was also where then President Ronald Reagan, with French President Francois Mitterand looking on, pushed a button to send a gleaming blue laser beam across New York Harbor toward Liberty Island during Liberty Weekend, celebrating the restoration and centenary of the sculpture. 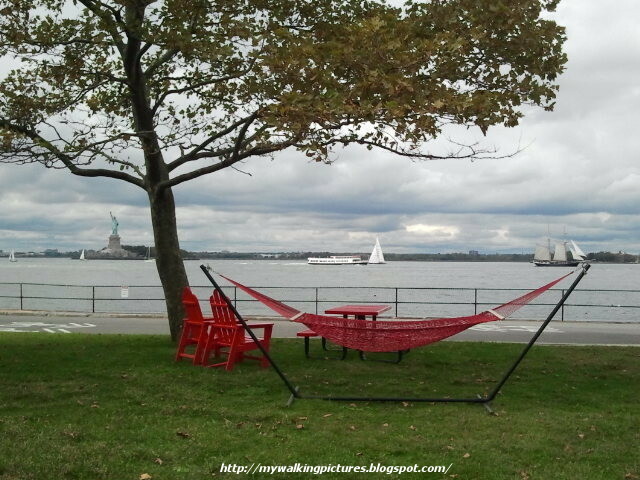 Picnic point is another grassy area with some tables, chairs and even hammocks. It's nice to just stay there and gaze across the magnificent view or just simply people watch. 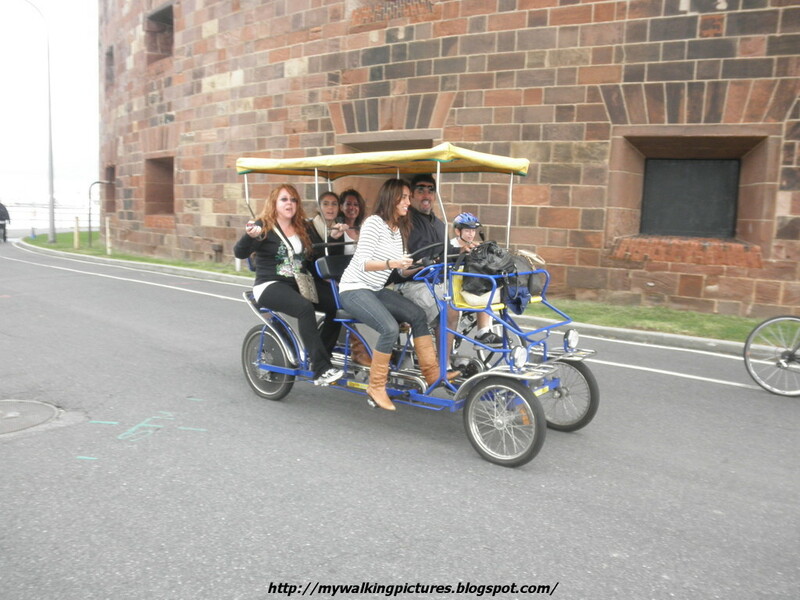 Since the island is accessible by foot or bicycle, it rents out different kinds of bicycles. 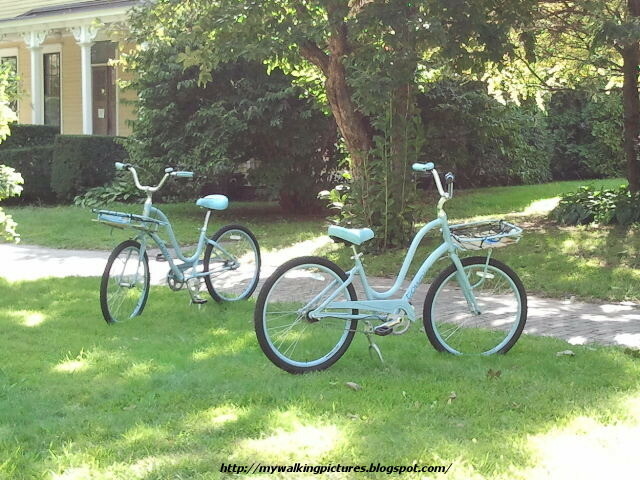 There are bicycles for individual, tandem and even surrey bikes for those in groups. 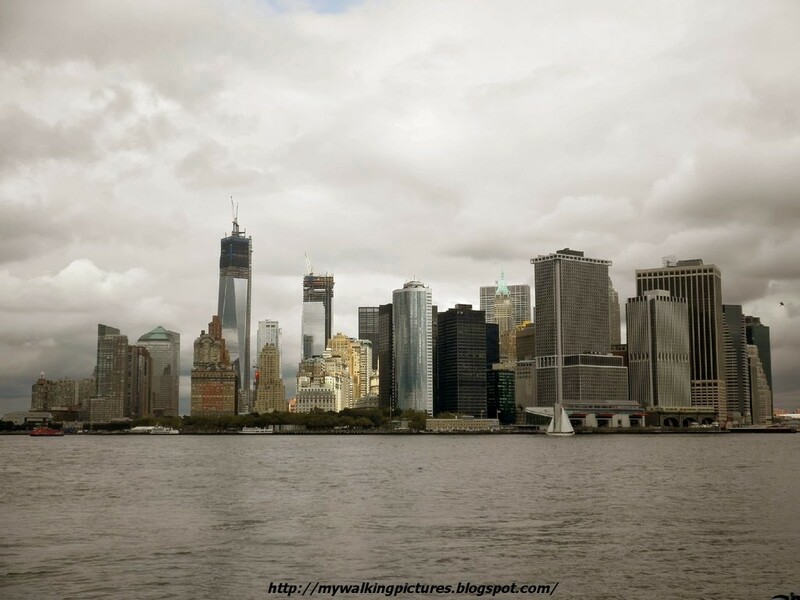 The gray day also gave me a different view of lower Manhattan from the previous one I had when I was at the island. 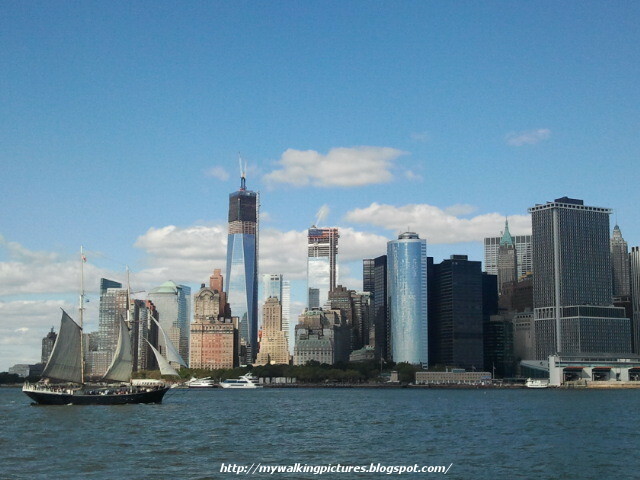 I think a cloudy lower Manhattan looks as good as the one taken during clear skies, what do you think? Soon, it was time for me to head back to Manhattan as I wanted to avail of my free ticket to the New York Historical Society courtesy of Museum Day Live! 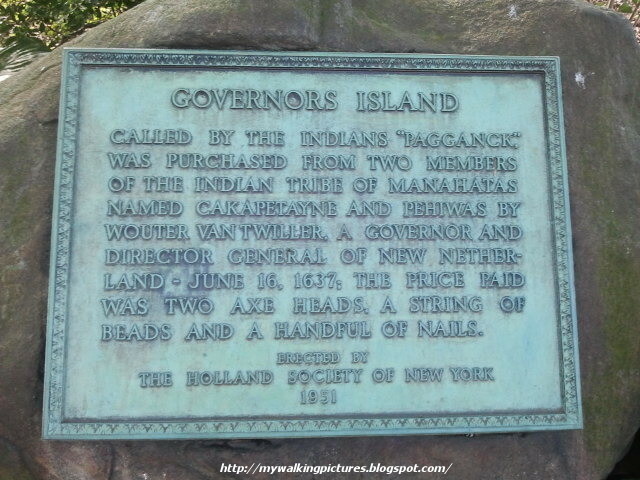 Governors Island was purchased with two axe heads, a string of beads and a handful of nails. It has come a long way since, and I hope the proposed improvements would further enhance its charms and historical value. I know I haven't covered everything I wanted to, so next season I'm sure I'll make it back. See you in 2013, GI!